Stay on top of ever-changing business conditions and requirements. Get real-time, consistent decision on which insurance products should be offered to an applicant. Avoid adverse selection, decrease dependency on underwriters, and provide consistent risk ratings. We have worked with a number of large insurance companies to overhaul web-based data collection systems, developing a thorough understanding of ACORD standards. We also have modernized several legacy systems with high levels of technical debt. 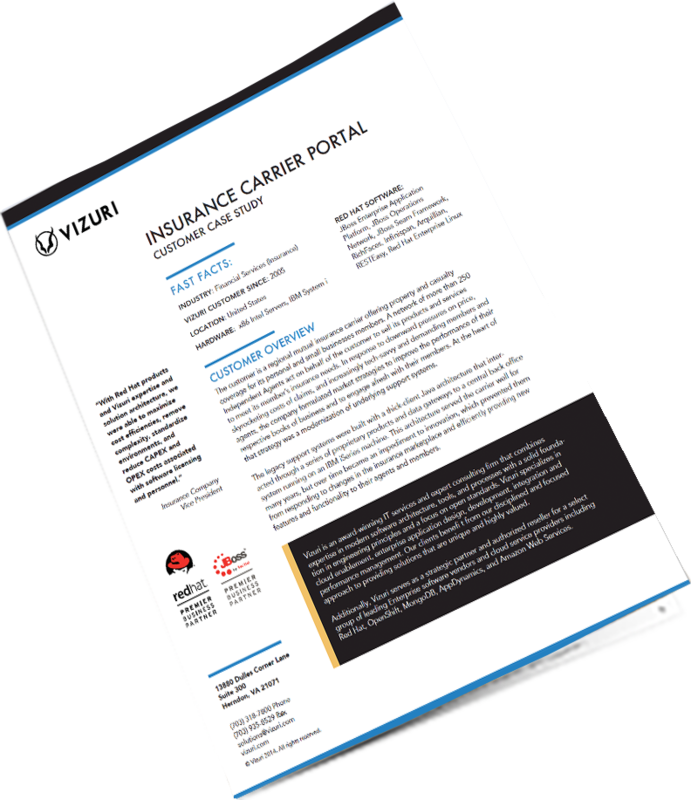 Vizuri has designed and implemented software architectures that leverage legacy information systems and provide an integration tier to expose underwriting rules. We have improved data collection quality via dynamic underwriting questionnaires, a solution which has since found wide subsequent adoption through our partners. We have also built agent insurance portals to meet a variety of strategic and technical needs. We have enabled rules to be authored by business analysts that can be deployed without developer intervention, resulting in a highly agile cycle to introduce changes to policy. We have also accelerated the launch of new releases, improved application ability to respond to changes quickly, reduced the need for underwriters to work overtime, and reduced training and onboarding of new staff. Vizuri delivered a robust contemporary solution architecture and advanced the customer's mobile enablement efforts. Understand how to approach complex patterns, business strategies, processes, and business rules—and then author usable rules into usable software.